The architects from Yazdani Studio of CannonDesign are behind the Tata Consultancy Services Software Development Campus in Kolkata, India. The architects from Yazdani Studio of CannonDesign are behind the Tata Consultancy Services Software Development Campus in Kolkata, India. The campus has received the Indian Green Building Council (IGBC) Gold rating for new construction. 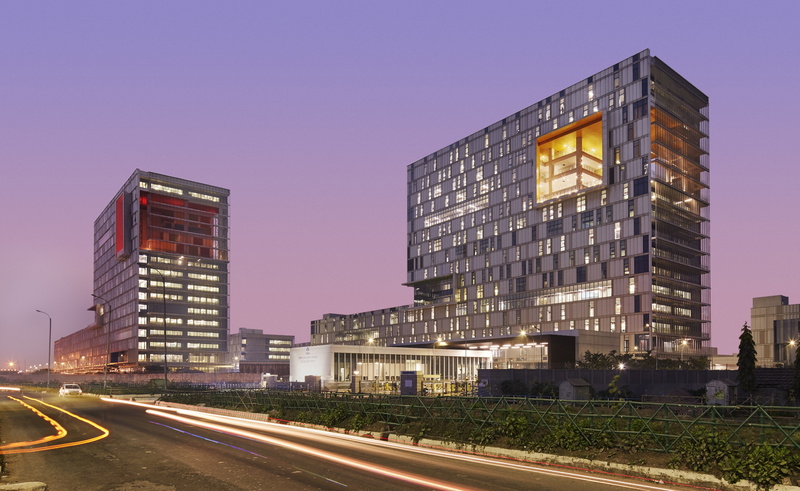 The new software development campus of Tata Consultancy Services is a large-scale project designed by Studio Yazdani of CannonDesign, the laboratory for exploration and experimentation in architecture under the leadership of the architect Mehrdad Yazdani. The numbers say it loud and clear: the new campus covers an area of 195,000 square metres housing more than 16,000 employees. Spread across a 16-hectare site, the design of the campus was inspired by the important role courtyards play in traditional Indian architecture, specifically the role they play in fostering community interaction and improving the microclimate of the park. As such, the entire site - including the buildings themselves - is filled with courtyards, dynamic building scales framing the courtyards, and a diverse sequence of landscaped spaces. The whole campus is spread across 11 blocks that are connected by pathways, which draw inspiration from the delta of the Ganges as it flows through Bengal. The campus architecture is defined by two 15-storey towers. The north side of the towers is clad in high-efficiency clear ceramic fritted glazing and sun shading devices. The south side integrates metal panelling into the facade and includes framed terraces and public spaces, giving the impression of constant movement which celebrates the leading-edge technology pursued inside the campus. Rooted in elements that define India and its traditional architecture, a lot of care and attention went into the extensive landscaping on the premises, with the planting of over 3,500 trees have been planted. Two unique ‘sky gardens’, located on the higher floors within the building structures, complement the greenery on the campus and present spectacular views of the vicinity. The project for the TCS Campus stands out for its attention to the environment: it uses space and energy as efficiently as possible to craft a truly sustainable workplace where the environmental impact is reduced as much as possible. This is a zero discharge campus, with 100 per cent water neutrality. No water is wasted: there are fully operational in-house plants for water and sewage treatment and the recycled water is used in landscaping, washrooms and in air-conditioners. The solar panels present on campus have a capacity to produce 300 KW of solar energy on site and everything at TCS Gitanjali Park is managed automatically and system-driven. On the back of these design decisions made by the client Tata with Yazdani Studio of CannonDesign, the campus received the prestigious Indian Green Building Council (IGBC) Gold rating for New Construction and is proof of how far the theme of construction sustainability can go as the driver of progress and example for future complexes of this kind.